I admit that the majority of us are more knowledgeable with Emotional Intelligence rather than Emotional Literacy as introduced by Weare that is ”the ability to understand ourselves and other people, and in particular to be aware of, understand, and use information about the emotional states of ourselves and others with competence. It includes the ability to understand, express and manage our own emotions, and respond to the emotions of others, in ways that are helpful to ourselves and others”. Another definition: “the practice of interacting with others in ways that build understanding of our own and others’ emotions, then using this understanding to inform our actions”. Because the meaning of emotional literacy can only manifest in an environment that is carrying about peoples' emotions which is highly interactive, it can only exist in a social and cultural context. Thermodynamic laws applied in science are part of the universal laws that govern our Universe therefore interconnectivity, chaos and order, degrees of cooperation and collaboration that we see in companies are part of the natural phenomena and its manifestation. In the companies we refer to customer complaints, internal insatisfaction, budget deficits etc. while in science we refer to critical points beyond which we will see major changes. The flaws in the model organization do not lie in the structural implications, but rather are due to their mean-field approximations and their neglect of large fluctuations near critical points. There are quite a few books where we can find terms used in Lean Six Sigma methodology. The topic is not whether we use the same technical terms since Lean Six Sigma uses knowledge of statistics, mathematics, project management, psychology, and business operations, but rather on developing new maps for Lean Six Sigma. The map that I will refer is the map of the theory of dynamical systems, which is a map that denotes an evolutionary function used to create discrete dynamical systems. Any dynamic system has a chaotic behavior and is a generator of fractals. In evolution systems we have an evolution in time of a system. Savvy leaders disperse knowledge because they understand that controlling knowledge diminishes value, while releasing the knowledge creates value. The questions is why don't we see in companies, organizations and countries in general a wider dispersion of knowledge. Considering the following steps in an organization or corporation; employees must be able to acquire knowledge through learning, transfer that knowledge from his/her head into an information system, apply then the knowledge from the information system into an actionable event, manage the knowledge that implies to execute with focus, timing and precision, and then secure the knowledge like to keep it from “evaporating”. Based on the above sequence the first step is access to learning that can be done by a company or an individual who considers that changes are required. The next step involves the use of technology which in many cases can be achieved through eLearning. The third and fourth steps are the most difficult because actions need to happen simultaneously while managing them timely with focus, engagement and precision. If we compare the above steps with a Lean Six Sigma environment they would pertain to Analyze and Improve phases. Securing knowledge involves control and a proper system that while dispersing information still allow flexibility for implementing and proposing changes. All companies and organizations can reach the highest level of knowledge since we have a process map that can be implemented. Mitochondria are essential components of nearly all cells in the body and are the powerhouses of cells by providing energy to carry out biochemical reactions and other cellular processes. It makes energy for cells by transforming the chemical energy stored in the food that we eat. Our food contains the building block of life known as macromolecules, mostly carbohydrates, proteins and fats. The energy stored in molecular bonds of these molecules is converted into a usable energy source known as ATP. Lean Six Sigma promotes learning, mentoring and coaching for sharing knowledge, solve challenges, and increase quality levels across companies and the world. Since one of the main components is the personal aptitude for learning and continuing education, we need to emphasize on the importance of both collaboration and cooperation in an eLearning environment while considering the intellectual giftedness. One main driver in several training organizations and educational organizations have been the offering of training and certification in classes that emphasized on the cost component rather than on the collaboration, cooperation and intellectual capabilities that can be enriched only through eLearning. In physics, quantum entanglement or "spooky action at a distance" defines that one object cannot be fully defined without considering the other. In statistics, but mostly in the Design of Experiments we are often interested in the effect of some process or our intervention (the "treatment") on "experimental units". Experimental units may be people, parts of people, groups of people, plants, animals, etc. Design of experiments is a discipline used in Lean Six Sigma with broad applications. Entanglement is a property of nature. Non-locality and hidden variables are two proposed mechanisms that enable the effects of entanglement. In many designs of experiments there are occasions when the mechanics do not provide enough information therefore we need to look for hidden variables and most importantly for non-locality in other words to events that do not happen in the same "location", but that are still connected. We will continue with the positive linkage between human behavior and Lean Six Sigma from previous ideas that we wrote about last week referring to the importance and role of frontal cortex development. Einstein has connected mass and energy through his formula E=mc^2. Let's assume that within a company we have 1000 people who are strongly motivated to create positive energy, and about 5 Senior Managers who have a large mass of inertia. Einstein experiment consisted in introducing photons that emitted light inside of a box. Since the box has its own mass and no outside action acted upon to move it, when photons radiated light, the box moved in the opposite direction from where the light irradiated. Most importantly, to ensure that a significant move in a pre-determined and positive direction is made, there are many and positive momentums that need to be created in a Lean Six Sigma environment in similar ways as photons create momentums by transferring light to mass. A static box will only be moved if there are enough photons that constantly radiate a required amount of light from different directions that hopefully will not become just a constant annoyance, but rather will imprint certain behavioral changes. The primary role of the frontal cortex is to direct and coordinate the functioning of other parts of the brain, both through a process of conscious thought and decision making by drawing on other neural resources on a subconscious level. This involves receiving input from the body's senses and processing that input to highlight the most important piece of information. The frontal cortex is responsible for the brain's ability to create long-term plans, govern emotions, creative and original thinking. BITSPEC had an amazing year in 2012 since we were able to build the IT Infrastructure on eLearning and Learning Management System, received accreditation as an Accredited Training Organization from PeopleCert and IASSC Lean Six Sigma, and started to have clients from across the world. Our success is based on work, an excellent team of professionals who communicate with each other although we reside on two continents and three different countries. Since our last Newsletter on Oct. 15, 2012, BITSPEC had 920 new visitors and 5483 viewed pages. 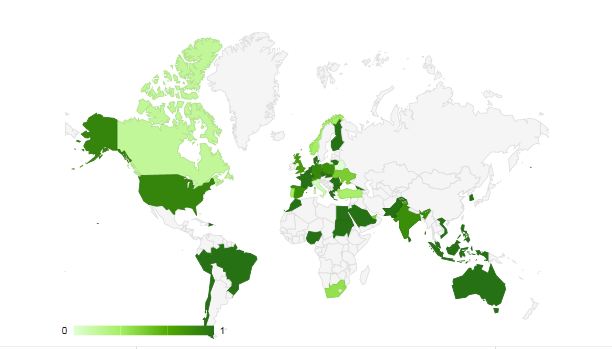 There were visitors from 48 countries who clicked on the web site. It is impressive how transparent and easy to use the technology became during the last years, and how can we all come together to communicate with each other on the common IT platform. Our intend is to engage more the students who take our eLearning Lean Six Sigma courses to share from their experiences. Because students are from different backgrounds, countries and industries our efforts are deemed to increase collaboration. We always look for feedback and questions that will help us all to further expand on both qualitative and quantitative knowledge, engagement and improvement in delivering eLearning courses. We will focus our attention on improving communication once Joomla LMS will be upgraded to meet the new changes made on Joomla 3.0 version. As part of our engagement across the world and the building on eLearning community, eLearning courses will become available on cloud computing and iPads/iPhones. BITSPEC team wishes you a prosperous Year 2013 and best of wishes to your families! Past Events: BITSPEC and Ahead Technology have accepted to work on establishing a collaborative partnership relationship. One belief of Universal Laws shall refer to the quality of life that all livings shall have. We should never accept the concept that quality is only good for some while other livings need to have a lower or no quality during their existence. The meaning of supervenience in Lean Six Sigma environment implies advanced development of knowledge realized through agents of change. Supervenient is used to describe relationships that are not reductive. As people we will need to reach for a higher level of mental understanding and communication. In 21st century new definitions evolve to reach for other dimensions as the world continues to develop to finding new meanings in the Universe. Literacy was known as to refer to those with the ability to read and write. Today's definition reaches another realm and UNESCO's regards 'literacy', in an attempt to recognize the diversity of definitions attributed to the term, as being beyond simply "the set of technical skills of reading, writing and calculating to a plural notion encompassing the manifold of meanings and dimensions of these undeniably vital competencies. Such a view, responding to recent economic, political and social transformations, including globalization, and the advancement of information and communication technologies, recognizes that there are many practices of literacy embedded in different cultural processes, personal circumstances and collective structures". A quality culture requires that mission, vision and leadership are all emerging simultaneously. The public statement provides a legacy that needs to be respected, followed through, and results communicated to all levels as international, national, regional, local. A commitment to quality also implies that the organization is committed to continuous improvement. Sharing the leadership in a quality organization implies that everybody has responsibilities, but is allowed at the same time to make mistakes while being critical and objective. In a quality culture the most evident qualities that will help the development of the Lean Six Sigma projects will be active listening, empathy, giving feedback and praise, managing conflict and negotiating. Most of the issues in Lean Six Sigma come from enthymeme that is a “truncated” syllogism because it comes to a probable conclusion instead of a certain conclusion. Through statistics data can be analyzed and enthymemes as ““Free trade is good” can be eliminated. An enthymeme may also do both: leave out one or more parts of a syllogism and come to a probable conclusion. Why developing empathy in the Lean Six Sigma world is important? There are many people and organizations that promote empathy in the world. The question that I have is why not all people have empathy? Based on research performed that used MRI to track brain changes, people who have a high level of empathy show that certain regions in the brain are activated when exposed to emotions. These include insula, or insular cortex, which is associated with bodily representations of emotions, and the temporoparietal junction, which previous research has shown to be involved in distinguishing between oneself and others, as well as in perceiving the mental and emotional states of others. Based on Google data there are about 40 million pages that contain information regarding Lean and Six Sigma. One of the reasons for creating such an intensive literature is due to performances reported by top companies that implemented this methodology. Another reason is that executives will always try to implement one methodology across the company rather than multiple systems that may not interact and engage with each other. In our course, we mention that as a combined management approach, Lean Six Sigma amplifies the strengths and minimizes the weaknesses of both approaches when used alone. Because it is being considered a methodology, most people will look for a guideline system for solving a problem with specific components such as phases, tasks, methods, techniques and tools. People will also look for systematic studies of the methods that are or can be applied within the discipline, description of methods, analysis of the principles of methods used, its rules and eventual postulates that are employed by Lean Six Sigma as a discipline. Researchers in Lean Six Sigma will also look for research results that can be quantitative and qualitative. There is not too much information shared across companies because we live in a competitive world therefore each company will try to protect the methodologies employed. What BITSPEC can do through eLearning 2.0, is to increase knowledge base by sharing techniques, practices, learnings, and studies or examples performed by our trainers, consultants, students, participants etc. Aside from FORUM, SOCIAL MEDIA and Blog, we introduced other modules that allow students and practitioners to communicate with each other on similar projects. By using eLearning 2.0 and Lean Six Sigma we can increase the speed of completing the most sophisticated and complex projects across various and diverse business areas as IT, HR, Operations, Logistics, Transportation, Healthcare, Education, Finance, Government etc. There should be no limitation to innovative processes since the outcome that we all expect is an increase of our quality of life. Each generation has their own approach to learn, but technological web based training advancements made in the last 10-20 years have offered the advantage of reducing repetitive work and shorten the time and cost of training, while students can engage in complex ways with each other through web facilitation. The Wall module provides our students the opportunity to be known in the world. The module is a responsive web design. As the user switches from notebook to iPad, the website automatically switches to accommodate for resolution, image size and scripting abilities. In other words, our Wall responds to the user's preferences. As eLearning Lean Six Sigma international interests is increasing according to the statistical data that we collected, we will continue to provide future news and information on knowledge management, as well as, the latest BITSPEC's technological and innovative advancements.